More than 150, 000 Canadians have owned a Toyota Certified used vehicle! Find yours now! The web server used by Certifiedtoyota.ca is located in Ashburn, USA and is run by Amazon.com. 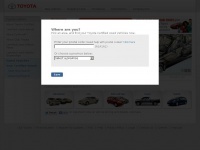 The server runs exclusively the website Certifiedtoyota.ca. The Certifiedtoyota.ca websites were developed using the programming language ASP.NET and served by a Microsoft-IIS server. The website uses the latest markup standard HTML 5. The website does not specify details about the inclusion of its content in search engines. For this reason the content will be included by search engines.